A friend of mine is leaving today for Haiti. She’s going with her husband to spend a week with her new daughter. Her daughter is six years old, and this will be the first time that either of them have met. My friend is adopting, and this is her first bonding trip. Can you imagine? Spending a week in a hotel room with a little girl you’ve never met but have prayed for – knowing that one day she will come to live with you in your home and become a permanent part of your family? My friend is anxious. I don’t blame her. I learned something from my meeting at Anne’s school today. Anne still saves her worst behavior for home. Everyone thinks Anne is sweet and loving. She just has a need for attention and lacks self-control. We came up with a positive reinforcement system that will hopefully give her more attention and rewards for good behavior. Which leaves me to deal with the ugly stuff at home. Stuff like being mean to Kate and yelling at me. Whining and crying and calling me “stupid” when she doesn’t get her way. You know… all the deeper “character” stuff. So, I’m pleased. I’m thankful for the individuals that surround and support Anne at school. They can work on behavior. And I’m thankful that Eric and I are the ones that get to pour God’s truth and love into her. We get to work on her heart. Thank you for your prayers! I have a meeting at Anne’s school today to discuss her behavior issues. The difference between Anne’s behavior issues before the accident and now… is that before, she saved all of her ugly, stubborn, selfish and mean behavior for her family. No one outside our home ever saw that side of Anne. Away from home, Anne was shy and eager to please. “A perfect little angel” people would say. You know, I like the world seeing the best in my children and leaving me to deal with the ugly stuff. That’s much easier than dealing with all the ugly stuff with teachers and therapists and counselors. Let’s just let everyone outside our home think that we have a perfect little family. I don’t want to share our “ugly side” with the outside world. Well, that’s not for me to decide, now is it. So Anne has been turned “inside out.” She doesn’t have the self-control to keep anything in. Everything she does and says comes straight from her heart – everyone gets to see ALL the bad – and ALL the good. And here’s the interesting part to me. Because she’s been turned inside out, it’s much easier to see the good. She’s fiercely loving & affectionate. She’s mean because sometimes she doesn’t feel accepted, and because she loves so deeply, the hurt is especially painful. I can look back to her “before-the-accident” self and understand much more clearly all of her crazy behavior. At the root of everything (both then and now), is a war between Anne’s deep desire to be loved and her compulsion to be in control of… EVERYTHING. Throw in all of her sensory issues (that were present before the accident) and we are left with one complex little girl. I don’t know how to solve Anne’s behavior issues. But I do know that she is treasured by her Creator. He is passionate about Anne. He loves her like crazy. And my deepest desire is for her to find her value in Him – and not how she behaves at school (whether good or bad). Anne continues to make slow and steady progress. Let’s see… Physically, she is smiling on both sides of her mouth and stretching her left fingers out straight 4 or 5 times a day. Whenever she uses these “new” muscles, she gets really excited. “Look at my big smile, mommy!! !” “Look, look! Look at my hand!” Can you imagine not feeling the left side of your mouth or not being able to stretch out the fingers in your left hand – and all of a sudden being able to do it?? To me, it’s more evidence that God is continuing to heal. Anne has also made big jumps cognitively. More of her personality is emerging. A good, upbeat song will come on the radio and Anne will say, “Oh Yeah, baby!” Her sense of humor and ability to use words continues to improve. She seems overall, more content and happy – although she continues to struggle with insecurities over being different. For the most part, she is keeping up academically in school. She has a hard time writing, so she will probably qualify for adaptive technology for first grade (in other words, she’ll get to use a keyboard to complete her work.) She is also less irritable and has a bit more stamina – which makes our lives a little easier, especially in the evenings. Anne’s seizures have drastically decreased in frequency, duration and intensity – but she is still having 1-2 very short, mild seizures a day. We’ll see the neurologist again in March to discuss our next plan of attack. But thankfully, the intense (horrible) seizures she was having over Christmas break stopped after we increased her current medication a smidgen. Thank you for your prayers! She still likes to mouth objects, but I think peer pressure is helping to curb that impulse. The other kindergartners just think it’s strange when she puts the wooden food in her mouth! This is just one example of why we are so grateful Anne is in a regular kindergarten class. There is so much value in positive behavior models for Anne! Anne’s rehab doctor is still concerned about the tightness in Anne’s left foot. Her left foot is stuck pointed down and in. This is a direct result of the brain injury – her brain is unable to send the correct signals to the muscles to tell her foot to relax. He’s persuaded me to start her on a medication that reduces muscle spasticity. I’m praying it doesn’t affect her mood or stamina level. Anne continues to be a source of great joy in our family. She has a unique ability to endear herself to others, so she brings joy to many people outside our family as well. This is a source of great encouragement to us! Our prayer is that God is glorified through this difficult circumstance, and when we see a glimpse of His glory in our lives, we are strengthened to persevere with gratitude! Thank you so much for praying for our family for so long!!! We had Anne’s annual IEP meeting last week – which is basically a time when all of Anne’s teachers and therapists gather in one room to review Anne’s progress and set new goals for the year. I always cry at these meetings… and I always feel silly when I do – but I can’t help it. I cry when I’m grateful, and I’m just so grateful for all the people that seem to be “for” Anne. They are truly rooting for Anne to do well, and I feel they give their absolute best to help her reach her potential. 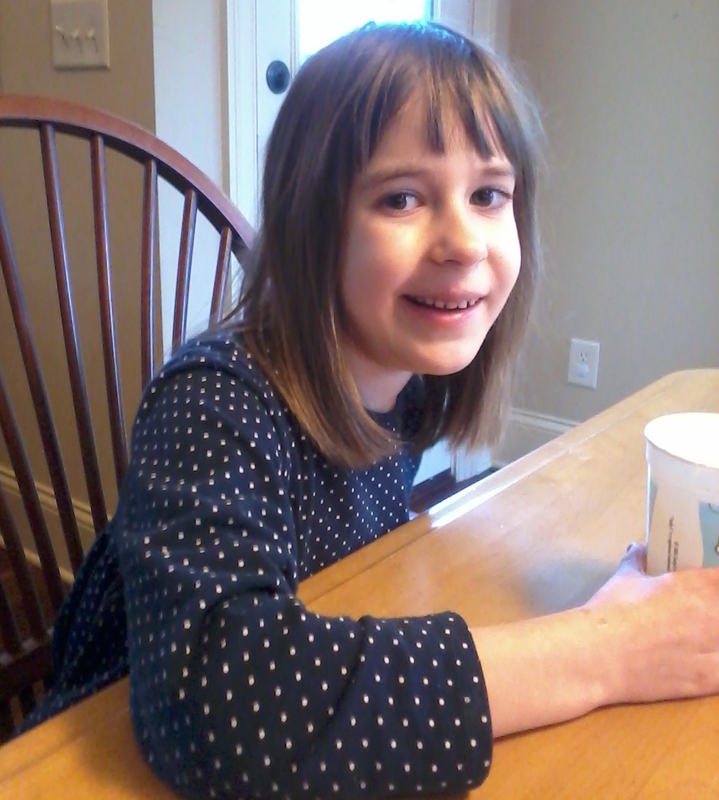 Anne receives Physical, Occupational and Speech therapy at school. She is in a regular kindergarten class, and she has her own para-professional to assist her in all of her school tasks – from writing to walking. Her para-pro is an answer to prayer. He (yes, I said “he”) is a recent college grad who has a degree in phys. ed. …He wants to coach – but he had to settle for being a para-pro… to a difficult seven-year old girl (who LOVES him – oh yes. Anne loves him.) He is so steady. He has endured much abuse from Anne – biting, hitting – but he never loses his temper – he just hands out the appropriate consequence. He notices subtle behaviors in Anne that others would easily miss – both good and bad. He takes the initiative to do more than what is expected to help her reach her potential. He really is impressive! Anne’s primary special ed. teacher is so dedicated. I feel like it’s her number one goal to provide the best services for Anne. Her therapists are all great, but Anne especially loves her Physical Therapist, Ms. Lynn. Somehow Lynn is able to push her without Anne getting too upset. Today she walked farther than she ever had… and she is starting to propel the walker a few steps by herself! How much farther Ms. Lynn? Finally, the counselor at Anne’s school recently reached out to me. She is going to include Anne in her Rainbows program (which helps kids cope with grief, feelings of being different, etc.) She told me that when Anne came to Nickajack, she took the initiative to read all of Anne’s CaringBridge site – just to familiarize herself with Anne’s history. She’s been following Anne, and determined that Anne’s self awareness has improved so that she would benefit from her Rainbows group. She’s right… It is the perfect time. Anne’s counselor was just named the NATIONAL SCHOOL COUNSELOR OF THE YEAR. Now that’s amazing!!!! The AJC ran an article about her. You can read about her here. Anne is doing so well in school… but one of the reasons is because she goes to a great school and she is surrounded by great professionals! Go Nickajack!!!! I’ve been encouraged lately by little bits of progress that Anne is making. All of Anne’s little gains add up to one conclusion… Anne is still healing. I’m so thankful for God continuing to knit neurons together in Anne’s brain!! Her smile is starting to include both sides of her mouth – not all the time, but we are seeing that left side of her smile more and more. She is tracking words from left to right more consistently in school. She can stand up out of her car seat all by herself – and scoot herself back into her car seat with verbal cues. She is learning how to stand from a sitting position by first pulling herself from sitting, to kneeling to standing. She uses her right hand to hold on to something for support and balance, and she’s real close to doing this by herself with only verbal cues. She is becoming just a little bit shy… (she was painfully shy before). She has mastered her 50 sight words and is beginning to learn more. She is counting objects now. This might seem small, but she wasn’t even close to being able to do this last May. I’m very excited! She can lift her left hand from her lap and place it on the table all by herself – without her right hand helping at all. 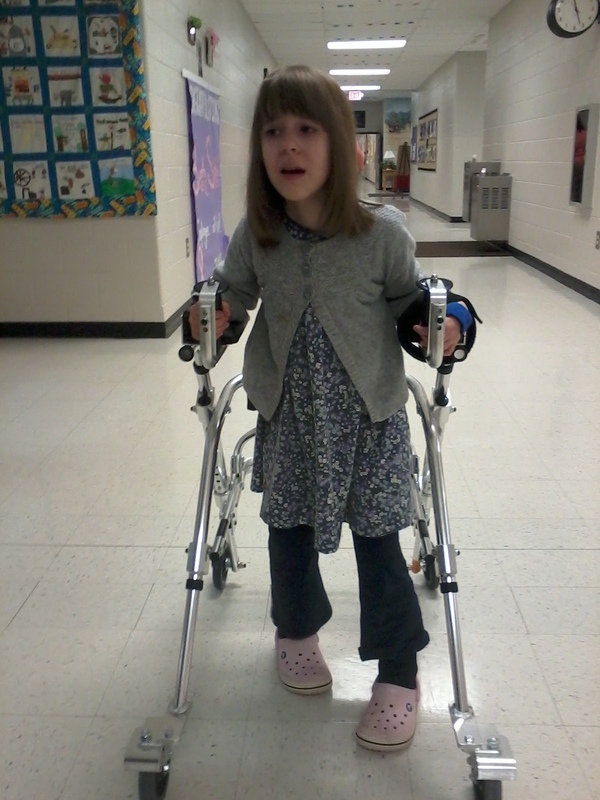 She’s walking farther… 300 feet at school with a walker before she starts to tire. She can sit and listen to a whole picture book being read. She used to close the book after just a few pages. Anne still has a long way to go, but we are so thankful for her continued progress! If you want to know how to pray more specifically for Anne, I update the top post on my blog on the 1st of every month with new prayer requests for Anne. And if you want to be notified by email each time I update the blog, just look on the right side for the “follow” button. Thank you so much for your support of our family. We are so grateful! For Thanksgiving, I wanted to bring back a post I wrote a year ago… about the relentlessness of disability. Out of all I’ve written in these last 19+ months… this is one of my favorites. Thankfully, Anne has improved in the last year, but the heart of this post – both my own desperate heart and God’s ever-faithful heart – are still the same. Thank you for praying for us so faithfully! And Happy Thanksgiving!!!! I’ve been a bit discouraged lately about something (that will probably sound strange) …Anne’s feet. I’ve always taken feet for granted. I find myself watching people’s feet now – how without even thinking about it, people can place their feet flat on the floor – without their ankles rolling or without going up on their tiptoes. I watch Kate jump – and I’m just amazed at the complexity of the brain – working the muscles and controlling the balance just so – to actually jump and land – solidly on flat feet. Anne’s feet are always pointed in and down. She can’t stand without braces to hold her feet at a 90 degree angle and to keep her ankles from rolling. It takes a minimum of 10 minutes for me to stretch her feet to fit in her braces. I can’t just get Anne out of bed and stand her up – no, I have to carry her everywhere until I have the space in my day to stretch her feet out. Why do I mention this? Well… Anne’s feet represent to me the relentlessness* of disability. It never ends. It’s constant and always with you. But here’s what I’m really thankful for. I’m thankful that I have to care for a child with a disability. I’m thankful for the relentlessness of it – because it is a physical manifestation* of who I am and who I have always been – completely dependent on God. Before the accident, I could deceive myself and live as though I didn’t need God – live as if I were not broken and completely dependent on God. We are ALL broken and in need of a saviour, but it’s so easy to live independently of God. Grieving and caring for Anne is so challenging that rarely am I not aware of my need for Him. And you know what is amazing? Yes, Anne’s needs are relentless – they are always there, but God is more relentless. He pursues me. He comforts me. He comforts Anne. He gives us strength, joy and perseverance. He helps us stay in the moment and not be overwhelmed by the future. HE IS OUR EVERPRESENT HELP IN THIS TIME OF TROUBLE. He is near. He is my God. That is what I am thankful for! *A few thoughts from this post came from Stephanie Hubach’s book on disability called, Same Lake, Different Boat . I borrowed the word ‘relentless’ from Stephanie’s book. I really resonated with that word… Also the idea of disability being an outward representation of our inner brokenness came from Same Lake, Different Boat . Thanks Stephanie! I’m so excited I could just burst!!!! At the beginning of the school year, Anne’s Kindergarten teacher sent home information about the “sight-word” challenge. On November 15th, each kid (that wanted to participate) would be tested on 50 sight words, and if the student could read 45/50 words, he/she could participate in a special after-school celebration. Anne and I have been working diligently since August. It’s taken Anne months of hard work to master the list… And SHE DID IT!!!! She got 48/50 words and gets to participate in the after school celebration today! Isn’t that AMAZING and WONDERFUL! I’m so proud of her! WOO-HOO!!!!! Thinking of how far she has come… Well it’s miraculous. May all the glory go to God “…who is able to do far more abundantly than all that we ask or think, according to the power at work within us, to him be glory in the church and in Christ Jesus throughout all generations, forever and ever. Amen (Ephesians 3:20).